Creighton University's Online MBA program offers a great deal of flexibility for students. Students can pursue a dual degree, can switch delivery between online and on-campus, or easily study across programs, Creighton's flexibility suits many MBA students' busy schedules and desire for both a quality education and an efficient use of their time. 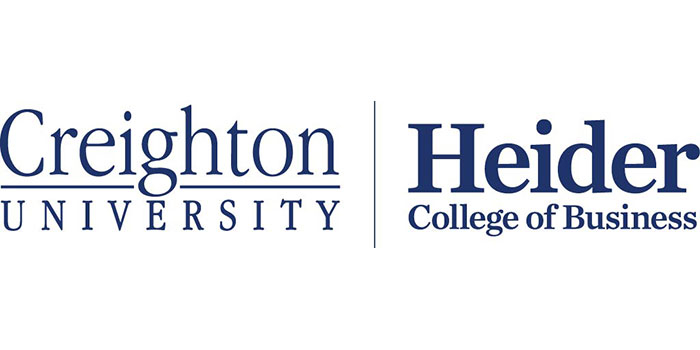 Creighton University’s Heider College of Business offers both a hybrid and online MBA. Which do students generally choose and why? Creighton University’s Heider College of Business offers both on-campus and online delivery of our MBA courses. Students have the flexibility to switch between online and on-campus offerings at any point, which allows them to choose the option that best fits their schedule. Our typical MBA student, whether online or on-campus, generally has been working full-time for at least three years and has a family or other outside responsibilities. Those who focus more on online courses do so because they don’t live near Omaha or simply for convenience. Creighton’s program can accommodate students new to business study or advanced students who already have a business degree—do you require GMAT scores for entry? We indeed do accommodate both students who have a business degree along with students who are new to studying business. We’ve set our curriculum to be flexible in this regard. Students who are new to business take all functional core courses (e.g., Accounting, Finance, Marketing, etc.) before moving on to more advanced courses, whereas students with a business background typically place out of those core courses and get to take more advanced courses. GMAT scores are required, but students may qualify for a GMAT waiver based on their GPA and work experience. Creighton offers dual degrees such as MBA + Law, MBA + Master of Business Intelligence & Analytics, MBA + Master of Investment Management & Financial Analysis, MBA + Master of Science in Negotiation & Conflict Resolution,, MBA + MD, MBA + PharmD, MBA + Master of Science in Organization leadership, MBA + Master of Finance and MBA + Master of Accounting. Do students value the dual degrees? This is correct, and we find that students are attracted to these opportunities to earn multiple degrees. We’re able to offer such a wide array of choices thanks to strong partnerships with other programs in the Heider College of Business and with other professional schools at Creighton. In addition to these dual degrees we offer our MBA with emphasis in one of three areas: Financial Psychology, Behavioral Finance, and Financial Planning. We also have an Executive MBA in Healthcare. Creighton University participates in the Jesuit Business Network and agree to transfer credits from other Jesuit universities. How do students take advantage of that opportunity? Students are able to transfer credits from other participating schools to Creighton by working with our MBA program team. When one of our students wants to transfer credits between schools, we’ll talk with our counterparts at the school offering the course to verify that our student is in good standing and to provide any other supporting documents that the school requests. This program initially was created to help students complete their degrees when certain life events, such as a job transfer, interrupted their studies. Not surprisingly, the growth of the online version of our MBA program has reduced our students’ need to transfer to another school to complete their degree. Now our students are more likely to take advantage of this partnership by taking a single course from a member school. This may happen in the rare instance where one of our students needs a course to graduate and we are not offering the course that semester or if the student wants to take advantage of a unique course like a study abroad opportunity. We see these opportunities to exchange credits as valuable to all participating schools and students because it helps students complete their degrees and expands their opportunities for learning and networking. And because many of our students come to Creighton for our Jesuit values, students will find the same value system in courses they take within the Jesuit Business Network. Online students interact with our faculty in a variety of ways. The primary means of interaction are the mechanisms built into the course, such as students submitting assignments (and faculty providing feedback), discussion boards, etc. Our faculty members also enjoy interacting with our students via email, phone calls, and videoconferencing. Our online students who happen to live in or near Omaha even sometimes come to campus to meet with their instructors face-to-face. As we’ve discussed, our MBA is flexible for students with a business background. Students are therefore able to design their MBA to fit their goals. Having asynchronous online courses provides even more flexibility to our students. Another special aspect of our MBA program is that all students are able to choose a concentration, which allows students to dive deeper and develop their skills in a subject area that will help them in their career goals. We’re also proud that the same group of faculty members who teach our campus-based courses also teach our online courses. At Creighton we take great pride in having faculty members who hold the highest degrees and certifications in their fields and who are recognized globally for their professional accomplishments and research. Yes, we do. Our Career Center is always available to help all our MBA students, including those in our online program. Our Career Center serves all Creighton alumni, too, so even after our MBA students graduate they are always welcome to use the services. Among the ways that our Career Center helps our students and alumni is by counseling them on career options, developing resumes and interviewing skills, and identifying internship and job opportunities. Career Center counselors and staff have relationships with companies and organizations around the country and can therefore serve our online students regardless of where they live. In terms of preparing for our MBA program, we find that students who are best prepared for the program and who can best take advantage of the program are those with a few years of full-time professional work experience after they’ve earned their undergraduate degree. An MBA is an applied degree, so students who have work experience to draw from will gain more knowledge from their peers and will contribute more fully in discussions. Along with work experience, students should know why they want to earn an MBA before they enroll. The clearer students’ goals are, the better they can develop a plan of study that will help them attain their goals. Finally, once students are enrolled we recommend that they not take too many courses simultaneously. We want students to complete the program in a timely manner, but ultimately we want students who are looking to do more than just “check the MBA box” on their resume. Students who take one or two courses at a time will have a better chance of mastering the content, being able to apply what they learn to their job, and developing into the next generation of business leaders. Thanks to Eric Neuman for participating. For more interviews, check out our Online MBA Report Interview Series.